We almost forgot to tell you about a new feature we snuck into the Pingdom uptime monitoring service a few weeks ago. As with many of our features, this one was added by popular request from our users (who we would like to thank for all the wonderful feedback we have been receiving). Now you, as a Pingdom user, can get a daily status email summarizing the monitoring results for your checks from the day before. This is a good way for webmasters and sysadmins to get automatic day-to-day status updates on how their network, servers and websites are doing. We have support for daily, weekly and monthly status emails. You can have the email sent to any of your contacts and also specify additional email addresses (which can be useful if for example the company management would like a status summary once a week). Above: Setting up a status email subscription couldn’t be easier. 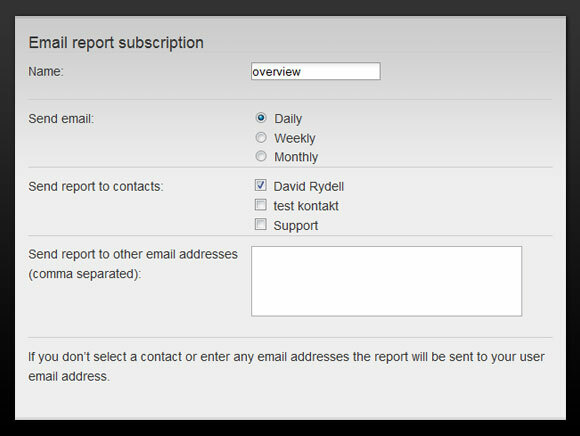 Note that you have to manually activate this feature in the Pingdom control panel by adding an email report subscription. And as always, if you have any feedback, please don’t hesitate to contact us. nothing better than monday coffee and weekly uptime report in your inbox!